People visiting L'Anse aux Meadows National Historic Site in Newfoundland, Canada, stop to admire this spectacular bronze sculpture with each person having their own ideas of exactly what it is. The sculpture is named "The Meeting of Two Worlds" and was unveiled on July 5th, 2002 in L'Anse Aux Meadows by Her Excellency the Governor General of Canada, Adrienne Clarkson. It relays a message about the historic encounters around Newfoundland with the meeting of the European settlers and the Aboriginal people who were the first settlers here. 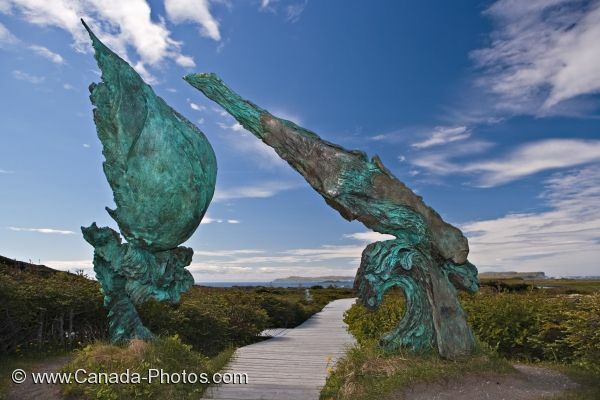 Picture of the bronze sculpture known as "The Meeting of Two Worlds" in L'Anse Aux Meadows in Newfoundland, Canada.